In mid-January, the congressionally created National Surface Transportation Policy and Revenue Commission released its final report, which, among other proposals, recommends raising the federal fuel tax by 25 cents to 40 cents per gallon over the next five years and thereafter indexing it to the rate of infla­tion. With the federal fuel tax at 18.3 cents per gallon of gasoline and 22.4 cents per gallon of diesel fuel, the commission is proposing that one of the nation's most regressive taxes be increased by a staggering 136 per­cent to 218 percent. These tax revenues would then be spent on a variety of new road, transit, administra­tive, and environmental initiatives, including a 700 percent increase in Amtrak subsidies. While these recommendations are supported by several government-dependent transportation trade associations—including major tax users such as the American Road and Transportation Builders Associa­tion, the American Association of State Highway and Transportation Officials, and the American Public Transportation Association—the Administration, tax­payers, fiscal conservatives, and many Members of Congress have openly criticized the report. To date, critics and skeptics have focused largely on the pro­posed tax increase, which would be little more than a massive transfer of income and wealth from motorists to a much bigger version of today's ill-conceived fed­eral transportation program and the select few who benefit from it. However, reading the full report reveals that many of the commission's other proposals are equally alarming and reflect a surprising degree of naiveté and misinformation about the nature and flaws of the American transportation system and the needed remedies. As expected from a report of this scope, the com­mission's proposed tax increase reflects an estimate of the money wanted to achieve a particular series of goals, which the commission implies have been carefully selected in accordance with cost-effective options, rigorous performance standards, cost-ben­efit analysis, and their contribution to congestion relief and mobility enhancement. Under this plan, annual federal, state, and local government spending (in inflation-adjusted dollars) on roads would rise from its current "sustainable" level of $68 billion to between $185 billion and $276 billion in 2055. Transit spending, with a pref­erence for electrified rail, would increase from about $13 billion to between $26 billion and $46 billion per year. While highway and transit spending would more than double, Amtrak (passenger rail) would hit the bonanza with spending increasing from $1 billion to $8 billion per year through 2055—an increase of 700 percent. In addition, the commission proposes including private freight railroads in the system of federal sub­sidies and recommends increasing investment in the freight system from $4 billion per year (mostly private) to between $6 billion and $8 billion per year through 2055. Currently, freight railroads receive little or nothing in federal subsidies. Notwithstanding the commission's repeated emphasis on its objective analysis, the report appears to have embraced a political solution that would accommodate a number of Washington's most influential and aggressive lobbying groups as well as the prejudices and preconceptions of some of its members. 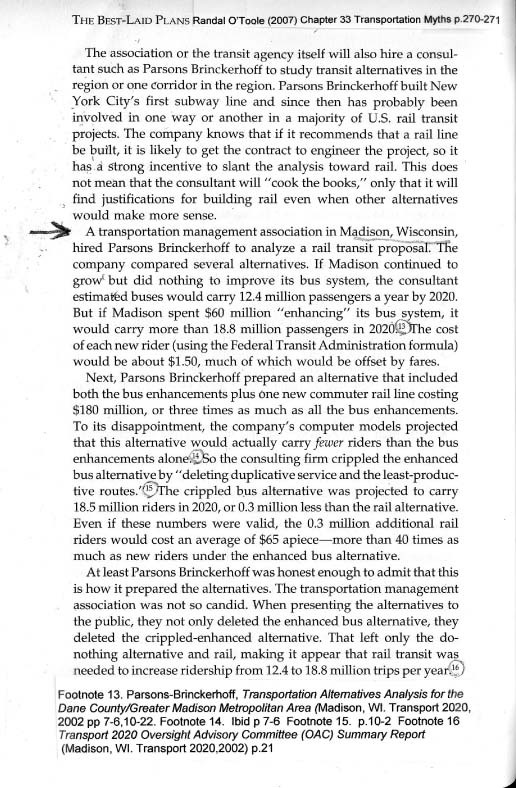 While some of its road proposals follow earlier analyses by the U.S. Department of Transportation (USDOT) that attempted to use cost-benefit analysis to identify and prioritize worthwhile highway projects, the commission used a different set of standards to assess passen­ger rail and rail transit projects because very few such projects would survive a simple cost-benefit analysis. As a 2004 USDOT study demonstrated, the per passenger federal subsidy to passenger rail is 45 times greater than the federal per passenger subsidy for intercity buses and 35 times the subsidy for commercial aviation. Transit is nearly as costly, requiring a per passenger subsidy equal to about three-fourths of the Amtrak subsidy. Moreover, despite huge state, local, and federal transit subsi­dies since 1980, transit's share of the passenger mar­ket has continued to decline—a decline that began in the 1950s. In addition to applying different standards to dif­ferent modes, the commission supplemented these measures with a series of qualitative intentions, mea­sures, and goals—notably in energy use, air pollu­tion, and concepts of "modal choice"—that the contemplated future modal investments must meet. While fuel economy and environmental deg­radation should certainly be considered in any objective function established to guide national transportation policy and investment, the commis­sion's process for developing and incorporating these considerations into its recommendations is surprisingly shallow, selective, and ill-informed. For example, it relies on recent U. S. Department of Energy (DOE)/Oak Ridge National Laboratory data to support the massive proposed subsidy to passenger rail, yet earlier and more complete reports by DOE/Oak Ridge and the Congressional Research Service (CRS) indicate that intercity buses are far more energy-efficient and environmentally friendly than other intercity travel options, includ­ing passenger rail. In fact, the DOE/Oak Ridge report for 2000 noted that intercity buses used about one-third of the energy per passenger that Amtrak uses. Inexplicably, the commission excluded any discussion of the environmentally superior and cost-effective opportunities that inter­city buses offer. Furthermore, the recent DOE data do not com­pare Amtrak and autos on trips of similar length and duration (e.g., intercity trips of 50 miles to 100 miles or more). Instead, the DOE data include many short, fuel-intensive trips, such as picking up the kids at school, buying groceries, and driving to work—services not yet provided by Amtrak. When Amtrak and autos are compared using similar-type trips, the typical auto is as fuel-efficient and envi­ronmentally friendly as Amtrak, as has been noted in CRS reports. Because of these research over­sights, the commission mistakenly embraced a series of costly and ineffective solutions and rejected the better choice of relying more on intercity buses and shifting to more fuel-efficient autos. The Transportation Commission is quite explicit in its embrace of 19th century transportation choices: "A cultural shift will need to take place across America to encourage our citizens to take transit or passenger rail when the option is given." The simple fact is that decades of huge subsidies (20 percent of federal surface transportation spending at present) and public-sector hectoring have not per­suaded Americans to get out of their cars. Transit's share of passenger transportation is less than 2 per­cent of the market, and 70 percent of America's transit riders live in just seven metropolitan areas. Such a small number of passengers concentrated in a handful of cities does not justify committing massive financial resources to a costly and ineffi­cient service that few would use. As bad as the eco­nomics and equity outcomes of transit have been, Amtrak fares even worse. Operating with a subsidy about equal to what it earns in ticket sales, Amtrak still attracts less than 0.5 percent of intercity passen­gers. On average, more than half of its seats are empty on any given route. With few passengers finding the prospect of a 19-hour trip from Wash­ington, D.C., to Chicago a viable travel option, the vast, motorist-funded subsidies proposed by the commission would have little or no effect on usage. Indeed, even the commission concedes that Amtrak's ridership load factor would remain below 50 percent of available seats despite the 700 percent increase in subsidies and the opening of new routes. By comparison, commercial aviation, which most humans prefer, averages a load factor of more than 80 percent. In November 2007, voters in the Seattle area faced a set of choices and opportunities on a local scale that are strikingly similar to the Transportation Commission's recommendations to the nation. The voters responded by voting down Proposition 1, a plan for a massive tax increase to fund a new light rail system in the Seattle area. As Michael Ennis of the Washington Policy Center (Seattle) explained, "Voters had an easy choice. They could either spend $47 billion and double congestion, or not spend $47 billion and double congestion. Quite logically, voters decided to save their money." The same reasoning would apply to the Transportation Com­mission's plan. Perhaps recognizing that most voters would share such sentiments, the commission included in its plan an anti-democratic tax and spending scheme in which American voters would have no say—direct or indirect—in any of its tax-and-spend recommendations. Under the plan, Congress would establish the NationalSurface Transportation Com­mission (NASTRAC), a new commission of 10 appointed officials serving six-year terms, to take responsibility for developing a national surface transportation plan. To perform this role, NAS­TRAC would be granted the taxing and spending powers necessary to execute the plan. Under this constitutionally suspect scheme, even the views of Congress would be rendered largely irrelevant unless Members could muster a two-thirds majority in both houses to "veto" a particu­lar NASTRAC proposal. Otherwise, NASTRAC's spending and taxing plans would become law in 60 days. Apparently, the President of the United States would have no role in the process, and USDOT would be relegated to a clerical function in support of NASTRAC initiatives. To put a more attractive face on this enterprise, which would have more in common with a 1970s Soviet central planning department than anything in the U.S. experience, the commission inaccurately claims that NASTRAC would be similar to the suc­cessful Base Closing and Realignment Commission (BRAC) of the 1980s. However, BRAC was tasked only with disposing of unneeded federal assets and land, while NASTRAC would be empowered to tax and spend—privileges that the Constitution grants only to Congress. While the deficiencies in spending and taxing are the most troublesome recommendations, several other commission recommendations should also be rejected, including the proposed reorganization of the USDOT bureaucracy and diverting more money from the highway trust fund. The Proposed USDOT Reorganization. Recog­nizing that years of rampant pandering to well-funded and influential constituencies have led Con­gress to create a USDOT encumbered with a con­fused array of programs, including several just for bicycles and a new one for sidewalks, the commis­sion has proposed consolidating these many little dollar-burning chimneys into a smaller number of big dollar-burning smokestacks. These seem to be designed more to pander to a redefined and updated collection of special interests than to implement cost-effective solutions to relieve con­gestion, increase safety, and enhance mobility. For example, the new rural/small city program appears to be little more than a mechanism to expand the scope of federal transit subsidies beyond urban areas and intercity highways to communities with little congestion and no need for costly, lim­ited-access highways. Moreover, several of these proposed smokestacks expose the federal transpor­tation system to wasteful mission creep and costly redundancy by encroaching on and replicating responsibilities of the Department of the Interior, the DOE, and the Environmental Protection Agency. More Diversions from the Highway Trust Fund. The commission's recommendation would exacer­bate the already serious diversions from the high­way trust fund to low-priority spending and non-transportation projects. Currently, about 37 percent of motorist-paid fuel tax revenues is diverted from the trust fund to projects of no value to the typical motorist who pays the taxes. The commission recommends allocating 7 per­cent of trust fund revenues to a newly revised and expanded environmental program. It also recom­mends giving Amtrak access to the trust fund to pay for the massive proposed increase in its subsi­dies. In addition, the commission encourages con­tinuing several of the existing diversions that provide limited value to transportation and mobil­ity, notably the enhancement program, programs for federal lands, and the requirement that states establish and fund metropolitan planning organiza­tions (MPOs). As in the years leading up to reauthorization of the federal highway program in 2005, the same col­lection of tax users and Members of Congress that wanted to increase the federal fuel tax are at it again, although now with the endorsement of a congres­sional commission that has, not surprisingly, embraced most of the prejudices, misconceptions, favoritism, and counterproductive views of the Congress that created it. Unlike most federal spending programs, the issue of taxation is of more compelling importance because the federal highway program is funded from the highway trust fund, which in turn is largely financed by federal fuel taxes paid by motor­ists and truckers. With no opportunity for deficit financing, spending is largely limited to the reve­nues received from the fuel tax. 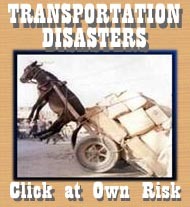 Therefore, any waste directly affects the quality of transportation in the United States. Similar constraints confront many state depart­ments of transportation (DOTs) that depend on fuel taxes, which range from 7.5 cents per gallon in Georgia to 31 cents per gallon in Washington State. With few exceptions in recent years, motorists in most states have successfully resisted efforts to raise transportation taxes, most notably in the Puget Sound region of Washington. For the most part, these voter rejections reflect distrust of state DOTs and MPOs and cynicism toward the elected officials who have not yet delivered on past promises of con­gestion relief. Advocates of a tax increase argue that, with the purchasing power of the federal fuel tax diminished by inflation and the demand for gasoline flattened by high oil prices, gas tax revenues have therefore been flat. At the same time, traffic congestion has steadily worsened in nearly all metropolitan areas, becoming particularly bad in the nation's leading commercial centers. Indeed, a growing stack of evi­dence suggests that congestion is beginning to affect the economic health of some communities as busi­nesses and workers transfer to less congested regions of the country. Nonetheless, state and fed­eral transportation policy institutions' long-stand­ing pattern of failure suggests that no good will come from giving them more money. If Congress, state governments, and the various transportation commissions are serious about devoting more money to meaningful transportation improvements, they should demonstrate their sin­cerity—and competence—by first eliminating the monumental waste in existing programs and rede­ploying the savings to cost-effective projects that enhance mobility. As currently authorized, only about 63 percent of federal trust fund spending in fiscal year 2008 will go to roads and services that are used by the typical motorist. The other 37 percent will be diverted to underutilized transit programs; federal lands; hiking and biking trails; enhancements (e.g., flower gardens, historic preservation, brick side­walks, and faux gas lamps); ferry boats; thousands of pork-barrel earmarks such as Alaska's infamous Bridge to Nowhere; scenic byways; metropolitan planning organizations; and the Appalachian Regional Commission—to name just a few of the many trust fund leaks. With these programs still in place and the com­mission promising to add even more, 37 percent or more of any additional fuel tax revenues would be diverted to questionable non-road purposes. As a result, to add another $1 billion of spending to the roads used by ordinary motorists, Congress would have to raise at least $1.58 billion in new tax revenues to cover all of the currently man­dated leakages. This is a bad deal for tax-paying motorists. Con­gress should reject the commission's proposals to raise the gas tax and expand diversions from the highway trust fund. In fiscal year 2008, the federal highway program is projected to spend $51 billion. By terminating the many ineffective diversions in the program, Con­gress could redeploy an estimated $19.3 billion to general-purpose roads. This amount, which would increase in subsequent years, would go a long way toward adding capacity and reducing congestion. Alternatively, obtaining this same amount while leaving all of the diversions intact would require raising fuel taxes by $30.6 billion. This is the sort of future that the Transportation Commission has pro­posed, and it is one that all motorists should reject. National Surface Transportation Policy and Revenue Commission, Transportation for Tomorrow: Report of the National Surface Transportation Policy and Revenue Commission, December 2007, at www.transportationfortomorrow.org/final_report (January 25, 2008). Ibid., Vol. 1, p. 6. Ibid., Vol. 1, p. 7. For discussions of these qualitative measures, see National Surface Transportation Policy and Revenue Commission, Transportation for Tomorrow, Vol. 1, pp. 2, 10, 21, and 22, and Vol. 2, pp. 4-2, 4-11, and 4-19. Ibid., Vol. 1, p. 26I. The report for 2000 was the last DOE/Oak Ridge report that provided information on intercity buses. Several of these many comparative energy studies are reviewed in Ronald D. Utt, "Congress Should Link Amtrak's Generous Subsidy to Improved Performance," Heritage Foundation Backgrounder No. 2072, September 18, 2007, pp. 11– 14, at www.heritage.org/Research/Budget/bg2072.cfm. See Stephen J. Thompson, "Amtrak and Energy Conservation: Background and Selected Public Policy Issues," Congressional Research Service Report for Congress No. 96-22 E, updated January 19, 1999, at http://digital.library.unt.edu/ govdocs/crs/permalink/meta-crs-1034:1 (January 25, 2008). ational Surface Transportation Policy and Revenue Commission, Transportation for Tomorrow, Vol. 1, p. 1. Ibid., Vol. 2, p. 4-21. For the commission's detailed discussion of NASTRAC, see National Surface Transportation Policy and Revenue Commission, Transportation for Tomorrow, Vol. 1, pp. 33–37. Ibid., Vol. 1, pp. 28, 30, 32, and 43.